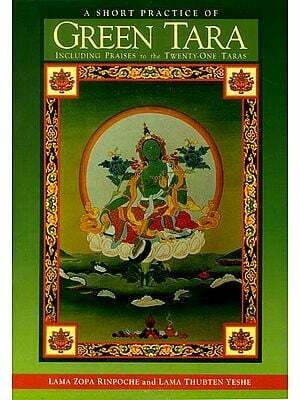 This book is of particular interest because it shows the presence of the Yogãcara (Mind Only) school in Tibet. It is well known that the Madhyamaka school flourished in Tibet, but less well known that Yogacara doctrines were also studied and practiced. The former school stresses the inexpressible ultimate; the latter, the natural luminosity of mind. This is probably the best introduction to the distinctive eight consciousness systems of Yogãcara. It also makes understandable the different meanings of (he profound älaya-vijnana) (the storehouse consciousness, or basis of all) that is the pivotal eighth consciousness in their system. For those interested in meditation, the author’s introduction explains how earlier Tibetan meditation (the method of allowing mind to look into its own pure nature) uses the eight— consciousness system. Tsong kha pa (1357-1419) wrote extensively on nearly every aspect of Buddhist religious philosophy and practice. The text edited and translated here is the Yiddang kun gzhi dka’ ba iignas rgyacher’ grel pa legs par bshad pa ‘i rgya mtsho, often referred to as the Commentary on the Difficult points. Gareth Sparham is unusual in that he is a respected academic and also has been a Buddhist monk for twenty years. He presently teaches at Langara College in Vancouver, B.C. He is an accomplished Sanskritist whose work on the Indian Buddhist writer Haribhadra has been published by Motilal Banarsidass. He spends part of his time in Dharmsala, India. Our interest in the Ocean of Eloquence began in 1979 while Gareth Sparham was still a student at the Buddhist Dialectic Institute in McLeod Ganj, India. The ‘Bras phung Blo gsal gling monk and scholar Dam chos rgyal mtshan gave a traditional explanation of it, according to a time-honoured rule, as a discursus during the study of the fourth chapter of the Abhisamayälaziikära. Gareth Sparham attended and debated the topics in formal session each day after classes with fellow students and jotted down a rough translation of the text for his own records. The appearance of this book owes to Dam chos rgyal mtshan and to the others at the Buddhist Dialectic Institute a debt of gratitude. They treated the Ocean Of Eloquence as a sacred book and considered sharing its insights a religious act. Gareth Sparham remains cognizant of the generosity they showed in allowing him to participate fully. At the University of British Columbiain 1985 work began on the text anew. Shotaro lida suggested to Sparham, his student in the doctoral program at UBC, that he resume work on the text and collaborate on a project to make it available to the scholarly community. lida, cognizant of the importance of Gadjin Nagao’s recent work on the Mahayäna-sathgraha (the book on which the Ocean of Eloquence is based), felt such a collaboration would be timely. He would like to acknowledge his debt to the pioneering scholarship of Nagao. He also acknowledges the contribution made by Nobuchiyo Odani and Tsultrim Kalsang’s publication of the Japanese translation. 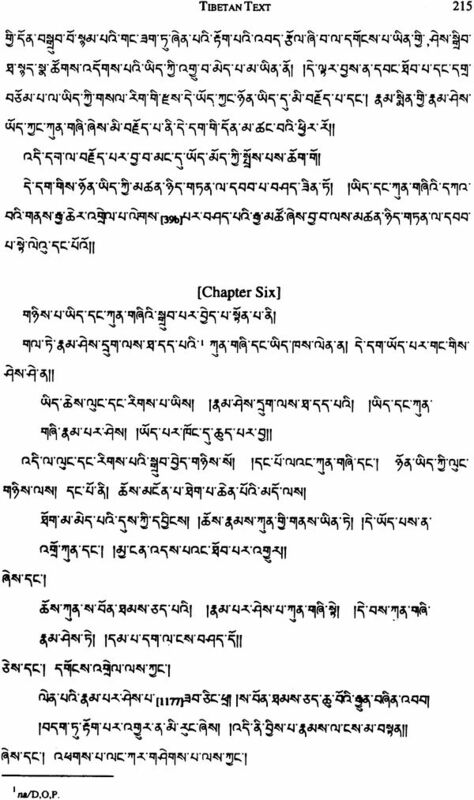 lida translated the parts of the text not covered by Dam chos rgyal mtshan and supplied material from Japanese sources. Sparham would like to acknowledge the support of the Indo-Canadian Shastri Institute which made work on this book possible during 1990-91 by granting a postdoctoral fellowship for research in India. The Tibetan fonts were designed by Pierre Robillard, whom we thank for allowing us to make use of his work. The text edited and translated here is the Yid dang kun gzhi dka’ ba ‘i gnas rgya cher’grel pa legs par bshad pa’i rgya mtsho (literally, Ocean of Eloquence: An Extensive Commentary on the Difficult Points ofAlaya-vijnäna and Klista manas, referred to hereafter as Ocean of Eloquence) by the Tibetan Buddhist writer Tsong kha pa (1357-1419). 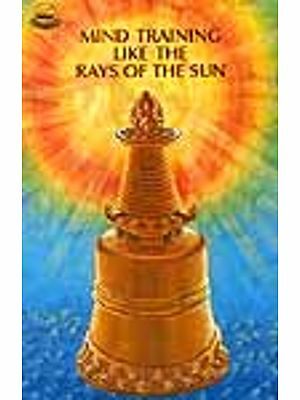 It is a detailed investigation of the last two of an internally coherent system of eight consciousnesses (vijnãna) asserted by Yogacãra, an Indian school of thought associated with the names of Maitreya[nãtha], Asanga, and Vasubandhu. 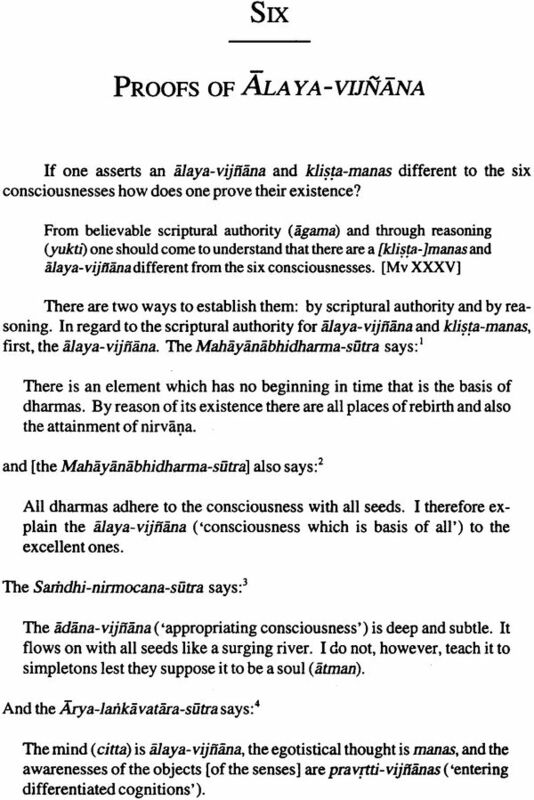 These two consciousnesses, which are a unique and distinguishing feature of the school, are the älaya-vijfJãna, an hypostasized ever-present subconscious, and the klista-manas, an hypostasized, ever-present egocentered thought. As will become clear, both Sanskrit terms cover a wide range of meanings which it is difficult to capture in single English equivalents. English hybrid translation words like ‘basis-of-all consciousness’ and ‘afflicted thinking-mind,’ though more exact, will be too cumbersome for felicitous usage in ordinary English prose so the original terms are retained throughout. This Introduction is in two sections. First the alaya-vijiiãna doctrine is dealt with in isolation, freed from later interpretation. From the point of view of the later exegete Tsong kha pa this doctrine is a sacred truth, a ‘revelation’ (buddha-vacana) to be explained. Then the later exegesis is dealt with. This exegesis presents itself as a nonoriginal restatement of the ‘revelation.’ It is Tsong kha pa’s Ocean of Eloquence itself. It is advantageous if the reader first becomes familiar with the älaya- vijnãna doctrine freed from later interpretation and then, armed with a prior understanding of that revelation, approaches what Tsong kha pa has to say. The ãlaya-vijnäna doctrine arose on the Indian subcontinent about one thousand years before Tsong kha pa. It gained its place in a distinctly Yogãcara system over a period of some three hundred years stretching from 100 to 400 C.E., culminating in the Mahäyäna-samgraha, a short text by Asanga (circa 350), setting out a systematic presentation of the ãlaya- vijnãna doctrine developed over the previous centuries. It is the doctrine found in this text in particular that Tsong kha pa, in his Ocean of Eloquence, treats as having been revealed in toto by the Buddha and transmitted to suffering humanity through the Yogacara founding saints (Tib. shing rta srol byed): Maitreya[-nãtha], Asanga, and Vasubandhu. The different streams of thought which culminated finally, in the Mahayana-samgraha, in the complex ideas which comprise the mature classical alaya- vijnäna doctrine are, in the Ocean of Eloquence, inextricably linked. 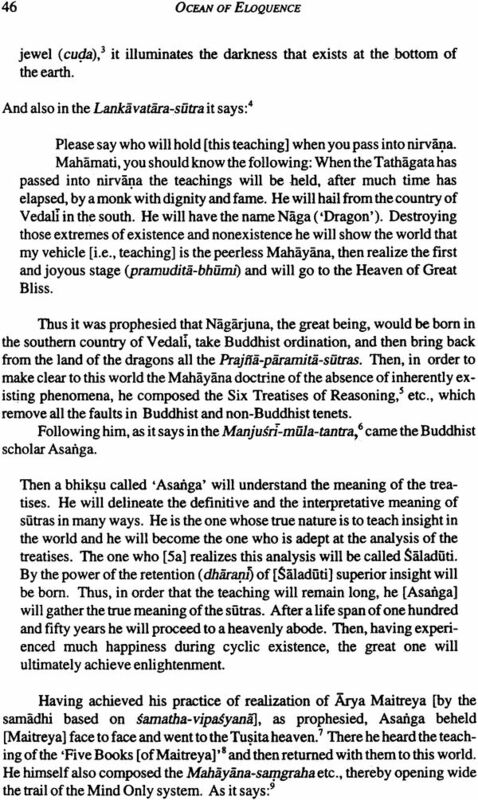 It will be the first task of this Introduction to separate the complex notions of alaya vijnäna and klista-manas set forth in the Mahayana-samgraha and to a lesser extent in the Abhidharma-samuccaya into their different parts in order to grasp what Tsong kha pa conceived as the starting point of his inquiry. As will become clear, the intellectual concerns of fourteenth century Tibet differed from the immediate concerns of early Indian Yogãcara, and Tsong kha pa’s presentation of the älaya-vijnäna doctrine in his Ocean of Eloquence reflects those concerns. As Tsong kha pa’s first major work (an important consideration which will be discussed below), the Ocean of Eloquence is important both for what it reveals of the Tibetan intellectual mileu into which Tsong kha pa was born and as a document showing the earliest stages in the development of Tsong kha pa’s thought. The second section of the Introduction deals with these matters. Before proceding, a brief word about the methodology of first explaining the älaya-vijnãna doctrine in isolation, freed from later interpretation (this is what I am loosely equating with a traditional person’s revelation) and then dealing later with its traditional exegesis. The approach, implicit in this Introduction, that first deals with the origins and history of an earlier ‘revelation’ in isolation and then with the way that ‘revelation’ is interpreted is entirely heuristic. It is based on the perception that I, and most western people I know, access information best when it is presented historically: But entering into the idea that the älaya-vijnäna doctrine was revealed by an Enlightened Being and that Tsong kha pa, as the center of a cultic belief, did make a nonoriginal presentation would not be uninstructive for some. Persons who already have a sense of history would certainly learn from such an exercise, just as much as the believer would learn from historical analysis. This is not an attack on the value and validity (even authority) of historical truth. In a slightly different context, Daniel L. Overmyer says: “My primary methodological consideration is to avoid reductionism as much as possible, that is, to meet the subject in question at every level on which it presents itself, without distortion. It is necessary to keep faith with the human beings who are the makers of history by seeking to understand their own purposes in relationship to the total context. This principle means to understand the relationship of historical situation to sectarian belief as a dialectical one, without seeking to give undue precedence to either.”4 It is something like this that I intend. What are the wider intellectual concerns which emerge in preclassical Indian literature and which provide the broader context, in the history of Indian religious thought, for the emergence of the particular Buddhist school that first asserted an hypostasized subconscious during the early centuries of the common era? Most important is the general notion of karma,5 a word which, as is well known, means ‘action’ but which comes to refer to the entire net of complex causes and effects wherein a particular action (or set of actions) is held to result in a particular sequence of results. Whatever the full story of its origins in India, a story which would entail a detailed discussion of the notion of sacrificial efficiency as well as the rich Indian tradition of grammatical speculation—both of which would carry the discussion far afield—the notion of karma became particularly important as an explanation of, and justification for, social status, particularly the notion of social status enshrined in the Vedic notion of four varnas (social classes). There are two dimensions to this: first the very natural human wonder about where one came from, and second the question of why one has the position in society that one does. In the Indian context perhaps more than in other societies6 the question of why one has the position in society that one does appears to have had a particular importance. The question of where one came from became almost inextricably mixed up with the question of one’s status or social class. Karma became a far more important notion than the concept of any single creator to explain one’s origins, even in distinctively theistic texts.7 So for Brahmanical writers, Buddhist preachers of the dasa-kusa1a-patha (‘way of ten virtues’), and Jam sages seeking to avoid any action whatsoever in an attempt to rid themselves of karmic residues, some notion of karma was central to explaining how one came to be here and one’s position in life.
. Yet if there were to be one notion that, even more than karma, characterized early Indian religious thought and deeply influenced the way later thinkers conceived of the älaya-vijnäna ‘subconscious,’ it would undoubtedly have to be that of a unifying ultimate. There is no need to dwell long on its content, well known in its general characteristics from the Upanisadic brahman and atman doctrine. It is useful, however, to recall the importance of cit (‘consciousness’) in the definition of this unifying ultimate and note three aspects: a) that it is in some sense ontologically more fundamental than other things, b) that it is the origin of them, and c) that an understanding of it is liberating. Amongst the Buddhist schools, the influence of this notion is most apparent in Yogäcara. It appears to have entered into Yogacãra thinkers in what might be termed the transformational (parinãmika) current of Indian thought. According to this transformationalist view the whole of waking reality is like waves on an ocean, not other than the one underlying reality. Diversity is only apparent, not lasting and true. We will come back to this current of thought later, in the context of a possible common heritage influencing both classical Samkhya and Yogacara.